Something I've wanted at work for a while is a way to get Jira to send me or a colleague a reminder about an issue on a certain date. Sometimes it would be really handy. For example, the other day an internal client came around to visit me and another developer to explain in detail a change that she wanted made. After the explanation she then told us that the change needs to be ready in about 10 months time. Since I had other more pressing issues to attend to at the time, I wanted to put the information I know into Jira as a new issue, set a reminder for 9 months time and forget about it. So I did a bit of searching and came across JRA-2848. It seems that this functionality doesn't exist in Jira yet as such, but I found out a nifty way to implement this using a custom field and a shared filter subscription. First of all, you need to create a custom field to store the reminder date. I called mine 'Send reminder on', and made it a Date Picker type. I applied it to all issue types (although you might argue that bugs should not need something like this), the global context, and only the default screen. On the default screen configuration, I put the new field just under 'Due Date' because I thought it made sense there. The next step is to create a filter to show issues that have a reminder date set to the current date. Create a new filter (I called mine 'Reminders'), that shows unresolved issues, where the current user is a participant (reporter, assignee or commenter), and the reminder date (value of the custom field you set up in step 1) is set to some time within the last day (using the relative date picker). If you don't use the 'participants' custom field in JIRA Toolkit, you could make the filter show issues assigned to the current user. Show issues where the participant is the current user, and the reminder date is today. It's also a good idea to share the filter so that other people can use it if they like. 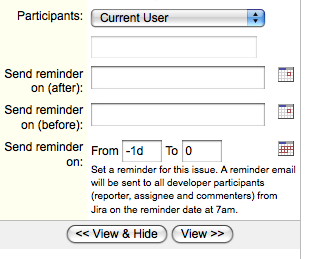 We have a group called 'jira-developers', and I shared my filter with that group. 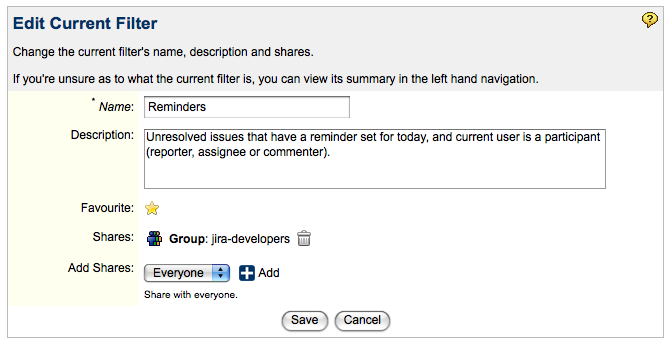 Note that I think shared filters are only available in the enterprise version of Jira. In order for people to get the reminders, you will need to set up a subscription to the filter. I made the recipients of my subscription the 'jira-developers' group in my organisation, unchecked the 'email zero results' checkbox, and set the schedule to daily, once per day at 7am. This way, if someone is a participant of an issue that has a reminder date set, they will receive a reminder email (because of the subscription) at 7am on the reminder day. And you're done! Now people should get reminder emails on the date that is set in the custom field. I find that it's also a good idea for people to uncheck the 'email me when I make changes' checkbox in their personal preferences. With this checkbox checked, they get a lot of emails from Jira that they immediately delete because they're about a change that they have made themselves. With it unchecked, emails from Jira have a lot more meaning, and they are more likely to take notice of the reminder email. Neat combination of the existing features and no custom coding. I had considered doing this with a service but this way is better. Interesting! I also think your last remark should be the default. When people start with JIRA, I always hear the complaint about it ‘sending so many emails’. I agree Wim, with too many emails they become meaningless I think. There’s one caveat to turning that checkbox off. If you have setup the CreateAndComment IMAP/POP service the user who sent the email to create the issue will not recieve an email. It’s an annoying thing I wish I knew how to turn off for this single case! If anyone knows how I’d buy them a beer to tell me. This post is now linked to from Atlassian’s Jira Tips of the Trade page , which has links to heaps of other neat tricks. I set up the filter to share with a certain group, but some reason I do not see recipients field when I created the filter subscription. Does anyone know why? 1. there’s no “Current User” value. 2. here we probably need a variable “participants” which – in the context of the user running the script – yields a list of users involved in the issue?